Is there such a thing as free money? I mean, in theory there is, but in reality, isn’t there always some kind of catch? Most people wouldn’t actually go near anything that claimed to give you ‘free money’, because it’s communally understood that ‘free money’ is something that comes with plenty of strings attached, sometimes in a very insidious way. Well, yesterday I was presented with an app that would like to give you free money, and after serious investigation, I can confirm there are no strings attached at all. This unique little app is called Tengi, and it’s available now for free on iOS and Android. Tengi is a messenger app, designed in the same vein as WhatsApp and a few other similar free messengers. 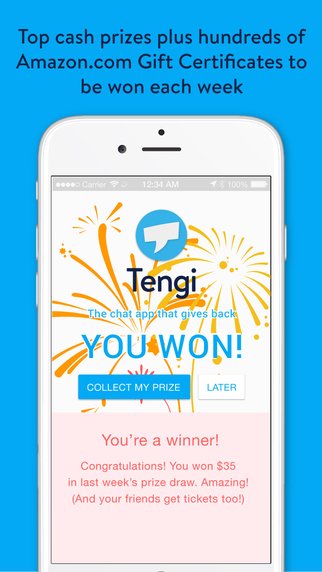 The big difference about Tengi is that it pledges to give back 50% of its advertising revenue in the form of weekly draws with real cash prizes for its users, ranging from £5 to a staggering £10,000. Now, I don’t know about you, but the idea of winning even £5 for using a free service that benefits me is extremely enticing. £10,000 is just ridiculous. And as I said up top, there are no hidden costs. None. The app is free to download, messaging is free, it’s all free. The only thing you have to put up with is a few ads; but remember, ads are your friend. They generate the revenue needed for the developers to give you, the users, free money. The rest of the app functions in the same way as those you’ve no doubt used before; a sleek interface which lets you send photos, videos, texts, form groups, and see when your messages have been delivered and read. The app of course is the main focus and the developers are continuing to improve it all the time. Though, not surprisingly, the gimmick part of the app has really caught on. Funny that. While it sounds like a questionable business model, it’s actually a very good one; who wouldn’t want to use a WhatsApp you potentially get paid big money for? The success id reflected in Tengi launching internationally this week; users from the U.S. and India will now have a chance to compete for the weekly prize draw. With plans to expand the service into many other countries, it’s just a matter of time before Tengi’s ingenious twist on messaging apps catches on all over the world. Get in touch with the App Store or Google Play to start chatting for free today!